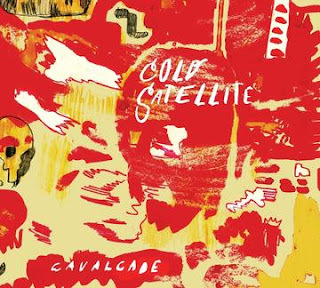 Cavalcade, a new album from Cold Satellite, is a country-rock triumph, an accomplishment in the vein of the great Twangtrust stuff Steve Earle and Ray Kennedy used to do, or going further back, an album like Tonight's the Night... strong guitars, heavy rhythm and lots of emotion and sometimes rage in the vocals. All lyrics were written by contemporary poet Lisa Olstein, who is about to release her latest book of poems Little Stranger, on Copper Canyon Press, coinciding with the CD release. “It’s a cold collaboration. Once (Olstein) hands off the work, she doesn’t weigh in,” Jeffrey says. I think it works - and repeated listens make the lyrics give up a little bit more each time. On first listen, bits of the words rise above the mix - and the effect is to make a striking juxtaposition between the all-out guitar rock and the poetic expression of the lyrics. And it's definitely a singer-songwriter record, it's just that the singer and the songwriter don't necessarily inhabit the same space. Check it out and see if you agree. The album will be out later this month (May 28) on Signature Sounds.